The first thing we did today was a focus group with all the women who have been involved already. They tore themselves away from an earnest discussion about how to convert their Change Maker t-shirts into more modest and comfortable gilets to whip out the mat and stools to share our experiences from our first outing with the trolley. They chattered enthusiastically and Ann, the staff member responsible for this part of the program struggled to keep up with translation. “Excited”, “Happy” – she managed to throw me a few words. Then we got into more of a conversation, one or tow of them even speaking a few words in English. “It’s the first time I am running in the camp since I arrived,” explained one, eyes shining. I was surprised – the running had burst out of them so spontaneously – I hadn’t realised it was a consequence of their feelings about the project. The heady, liberating feeling of being on the open road with a vehicle and a purpose. It was also the first time they had heard music in the street they explained, and the first time they had been on the football pitch. It became apparent that being the stewards of the trolley gave them a sense of status and significance that was allowing them to do things they had never even dared consider. “We should call it the Pop Up Party” they declared, explaining that everywhere it went became an instant party. And they were right – the supermarket, the football pitch, the roads we walked along, had developed a party atmosphere. They described taking out the mat as ‘opening’ so they were also the Party that could Pop Up and create fun or reflection or connection anywhere. I liked it. They were proud to that they had been invited into other areas like the UNFPA Centre. It was breaking down barriers between organisations and today I wanted it to be about breaking down barriers for the most isolated women. I was curious about their resistance to parking the Pop Up Party between the shelters as I had originally envisaged. They admitted they had found the first outing stressful and uncomfortable – and looked very relieved when I said it had been for me too. It shifted the discussion even further into collaboration. However, now they had built their confidence they explained, and understood how it worked, they were ready to go anywhere. This was an important learning point for me. In order to empower the isolated women in the shelters, these women pushing the trolley first needed to feel empowered. They went on a fast journey from that initial discussion only the day before yesterday, to now where not only could they do everything I had hoped for but they were improving and refining and spreading their wings further into ideas I had not thought of. I discovered for instance that the day before they had been asking women who were interested if they could play it in their block and if they had a talent – storytelling, singing, teaching – that they wanted to share. Developing content ideas already! They decided to do two things today after the discussion. To ‘open’ in the community centre for publicity and awareness building and then to go to the part of the camp that hasn’t been electrified yet as those refugees have fewer entertainment options. ‘Let’s start!’ they declared and wheeled out the contraption to the open courtyard where people wait at the Community Centre for various services. Within minutes the place was transformed from a quiet waiting area to party central. The music was roaring and the men were dancing around the green mat. Everybody was grinning – the security guard, the staff, the refugees… and me. Afterwards the women told me how much they missed dancing – men can dance in public but not women – and asked if they could use the Pop Up Party to have a women’s dancing session behind closed doors. Of course! Another application I hadn’t imagined but which made perfect sense. Later, when my dream was realised and the idea I had a year ago of sitting together between the shelters listening to a radio soap opera was happening right before my very eyes, I was struck by the fact that there is really nothing on this trolley that doesn’t already exist in the camp. It’s far from being rocket science and yet this simple bringing together of elements has unleashed energy and creativity. These women now have agency. The trolley has given them a sense of purpose and place in society. Just as I imagined, there were women who confidently strode forward, joining in immediately, even petitioning us on the long walk to that part of the camp and then running ahead to rally support before we arrived. Others who stood shyly a little outside the circle – though always responding with a smile when I made eye contact. And a few peeked out from their shelters. That’s fine. Hopefully over the next few days they will get braver and emerge. They are a warm, tactile people. Everybody shakes hands when they meet. I find that in business circles at home but here it is much more prevalent. And then the second time the greeting might be three kisses. 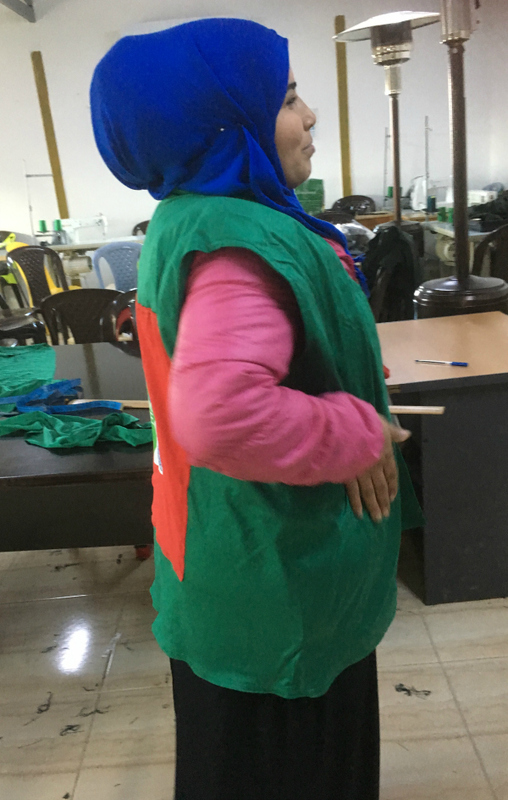 When we are walking around the camp with the trolley they like to link arms – with each other and with me. It is a comforting feeling, it reminds me of childhood. Why do we not do that more as adult women in the west? And of course the children, especially the little girls, all want to hold hands, or lean against you. I feel part of this community here even though of course that is far from true. In a few days I will return to my life with its abundance of safety, prospects, possessions and options. Yet there are things about their lives here that are enviable. In the midst of their hardship they seem to live by some important concepts of humanity and community that we often forget in our busy lives. Artmongering with Refugees: Chapter Four from Matt Allen on Vimeo.